????? Crewe - Wilmslow - ?Manchester Piccadilly? 40020 ?Manchester Piccadilly - ?Guide Bridge? 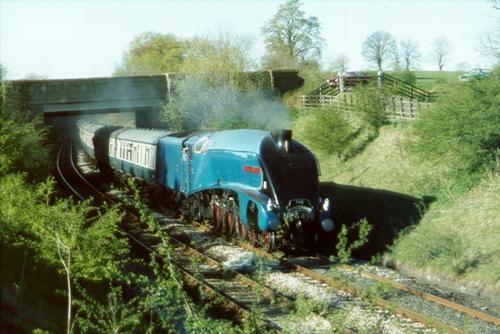 (1) Tony Bowles comments: As regards the query regarding motive power used on sections of this tour. I have just scanned a Trevor Rowe slide taken at Woodhead on that date of an eastbound passenger train which surely must be the tour as the line had long been closed to normal passenger traffic. The locomotive numbers written on the slide are 76011 & 76021 although these cannot be read on the locos themselves. 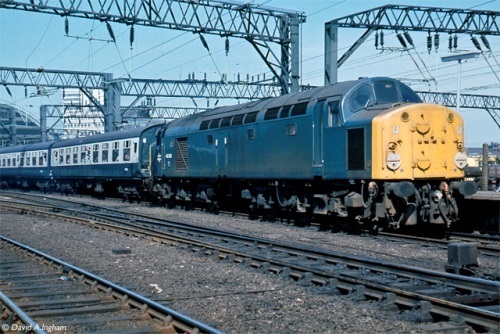 Added to this David Ingham has now provided a photo of 40020 on the same train departing from Manchester Piccadilly but it is not known where it worked from or to.